What are the Types of Ear Deformities? There are several different types of ear deformities in children. An ear deformity is different than an ear malformation, which is defined as missing skin and cartilage. Typical ear malformations are microtia or anotia, meaning the child is born with one ear or the ear or ears are partially or completely missing. Cryptotia and minor constricted ear deformity, which are categorized as ear malformations, can be treated with ear molding. 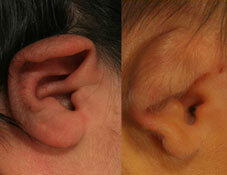 A child born with an ear deformity is not missing any skin or cartilage but only misshapen. Our experienced craniofacial surgeon, Dr. Eric Payne, offers the most advanced non-surgical and surgical ear reshaping procedures available to address these concerns. Follow the links below to learn more about the types of newborn ear deformities. If you have additional questions, or if you would like to schedule a consultation, please contact our office today. 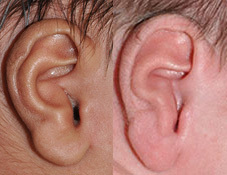 Sometimes called Spock ear, Vulcan ear, elf ear, or Satyr ear, this condition occurs when the upper third of the ear has a pointed or prominent shape. In some cases this is due to an extra fold in the helix, as a result of a flattened section of the helical rim, or both. 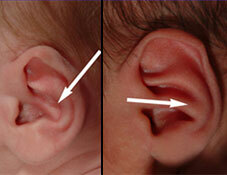 Similar to lop ear deformity, this baby ear deformity causes the upper helical rim of the ear to fold over. Generally, lidding ear deformity will involve a tighter crease than lop ear deformity, and there may even be a rolled appearance in severe cases. 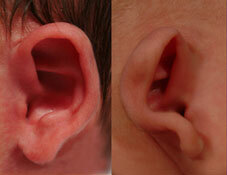 Lop ear is defined as a folding of the upper third or half of the ear. 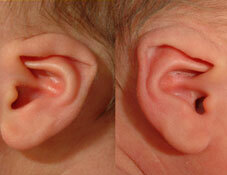 This newborn ear deformity is very similar to lidding in that the upper helical rim is folded over. 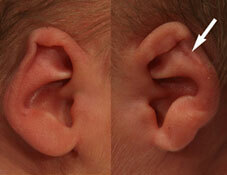 Projection of the mid-rim from the skull greater than 7mm in a newborn infant is defined as a prominent ear deformity. This is the most common defect, accounting for 45% of all ear deformities. It is frequently missed and very difficult to treat, especially with surgery. A variation of prominent ears is called “Cup Ear,” which is a more severe form. Some have suggested a genetic link, since parents with prominent ears will frequently have children with the same deformity. In this advanced prominent ear deformity, the helix and lower lobe (lobule) of the ear are pushed forward and bend in toward each other and toward the head, while the middle portion of the ear remains back. This creates a cup-like shape. It’s considered a prominent ear deformity, as it causes the ear to project significantly outward from the head. Constricted ear deformity refers to a number of defects where the helical rim is folded, wrinkled, or very tight. 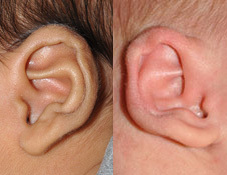 The ear often experiences reduced height due to the folded or flattened appearance. The conchal bowl is made up of two parts: the cymba superiorly and cavum inferiorly. The conchal crus ear deformity is an abnormal outward fold dividing the concha cymba in half. This deformity can be corrected using the EarWell™ device with the conchal conformer. The conchal bowl is the hollow or depression located near the ear canal. It is made up of two indentations called the cymba and cavum. In inverted conchal bowl deformity, the concha is projected outward, causing the narrowing of the external ear canal, and the anti-tragus on the lower ear may be affected as well. This can later cause problems using headphones or earbuds and even issues with ear wax buildup in the ear canal. Also called buried ear or hidden ear, cryptotia is a defect in which the upper ear is partially concealed by the side of the head. In many cases, the scaphoid fossa and the antihelical crura also will be smaller and underdeveloped, giving the ear a pinched appearance. These areas are surrounded by the helix on the upper ear. Typically skin flaps or grafts are required to correct this deformity with surgery. The biggest problem is the inability to wear eyeglasses or sunglasses, since the ear does not have normal skin fold and projection. 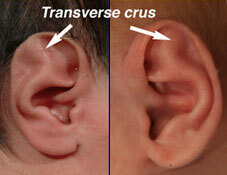 Ear molding has been successful in eliminating the need for future surgery with skin grafts. This defect occurs when there is a lack or deficiency of skin or cartilage in between the scapha and the rim, causing a clipped, depressed, or indented appearance on the outer edge of the upper ear. Mixed deformity of the ear involves multiple conditions combined, and may include Stahl’s, lidding, lop, constricted ear deformity, or other defects. The EarWell™ device can effectively correct a number of common and complex infant ear deformities, including mixed ear deformities, if utilized soon after birth. 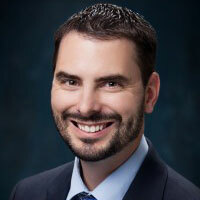 Every patient’s situation is unique, and Dr. Payne will discuss the optimal treatment plan during the initial consultation. For more information about the various types of ear deformities, please contact our office today. Our skilled medical team can answer your questions or help you to schedule a consultation.